Located only 1 hour 45 minutes drive from Melbourne, and nestled in the highly sought after Mansfield District, this magnificent and established farming property of 405 acres / 161 hectares boasts an enviable lifestyle prospect for those seeking country life coupled with extraordinary comfort. Janiemont Homestead itself, with 291m2 of living, is an immaculate 4 Bedroom and 2 Bathroom residence with a spacious open plan and combined kitchen/ dining/ living area plus an adjoining large formal lounge. The home, originally built in the fifties, has been thoroughly renovated during the last few years, transforming this large home into a delightfully light and bright, modern family environment. Set amidst superb gardens, lawns and exquisite, established feature trees the homes wide return verandahs have exceptional views to rolling farmland and distant mountains of the district and beyond, from every conceivable angle. Incorporated into the various feature gardens surrounding this impressive home are relaxation areas of lawn tennis court, overlooking a large ornamental lake, fabulous court yard in-ground pool and entertainment deck whilst a 20 x 40 metre menage stands close enough for an easy stroll and workout with your favorite horses. A range of "cross country" rider training facilities are within the close house paddocks for some exhilarating work- outs. 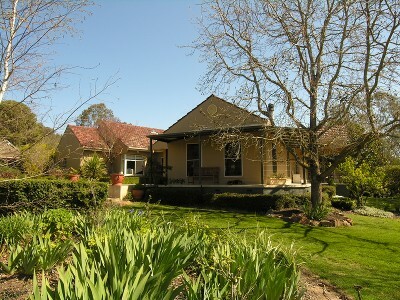 Discreetly set within the gardens is a delightfully renovated and fully self-contained 1 Bedroom Cottage/ Flat giving guests or your extended family some wonderful farmland views from its own intimate and shady verandah. A Farm Office and further Cottage are also located within the immediate precincts of the house providing further space for a children's playroom/ farm office or further accommodation as required. The Farm is comprised of 10 paddocks with a full fertilizer history that are serviced by 13 dams providing ample diversity for stock carrying and pasture production. Outbuildings and Shedding provide a Large Workshop and Stable Complex including 3 loose boxes, Store Shed plus 3 Stand Shearing Shed / Yarding and Steel and Timber Cattle Yards. Janiemont blends an excellent mixture of tree studded and open grazing land and native plantation landcare areas to allow a diversity of opportunity rarely seen amongst holdings of this size and standard. Holdings of this size and quality are rarely offered to the market and must be seen to be appreciated. Call John Canavan on 03 5775 2792 to arrange an appointment to inspect this wonderful farming property today.